Written with clarity, wit, and rigor, The Philosophy of Art provides an incisive account of the core topics in the field. The first volume in the new Foundations of the Philosophy of the Arts series, designed to provide crisp introductions to the fundamental general questions about art, as well as to questions about the several arts (such as literature, music or painting). 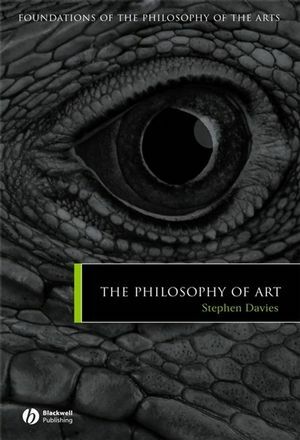 Presents a clear and insightful introduction to central topics and on-going debates in the philosophy of art. Eight sections cover a wide spectrum of topics such as the interpretation of art, the relation between art and moral values, and the expression and arousal of emotion through art. Pedagogical features include full-color illustrations, vibrant examples, thought-provoking discussion questions and helpful suggested readings. Stephen Davies teaches philosophy at the University of Auckland. He is the author of Definitions of Art (1991), Musical Meaning and Expression (1994), Musical Works and Performances: A Philosophical Exploration (2001), and Themes in the Philosophy of Music (2003), and the editor of Art and Its Messages: Meaning, Morality, and Society (1997) and Art and Essence (2003). Why study the philosophy of art?. A biological basis for art. The cultural invention of art. The big and the small picture. "It all depends what you mean by the word art.". Applications and Connections - the museum, tourist art, popular art, and ancient art. Arguments against the project of definition. If not an essence, what unifies the concept of art?. Applications and Connections - intuition versus definition, art's value and definition, Euthyphro and experts. 3. Aesthetics and the philosophy of art. The aesthetic attitude and art for art's sake. Artworks that pose a challenge to aesthetic theory. Art for art's sake, again. Applications and Connections - copies and misattributions, viscera and understanding. Are artworks created or discovered?. Are all artworks potentially multiple?. New works based on old ones. The ontological variety of works of art. Is the identity of an artwork fixed or evolving?. Applications and Connections - musical recordings, the movie of the movie, the matter replicator. Does interpretation change the work's meaning?. What is interpretation's primary purpose?. 6. Expression and emotional responses. Identifying the emotions in art. The expression of emotion in music and abstract art. The emotional response of the audience to the work of art. Responding to the expressiveness of instrumental music and abstract art. 7. Pictorial representation and the visual arts. Representation — culture and biology again. Art versus non-art, a matter of style. Representation in photographs and paintings. 8. The value of art. Rules, universality, and objectivity in artistic evaluation. The purpose and form of artistic evaluation. What is rewarding about the experience of art?. The relation between artistic and moral values. Should a work's immorality undermine its claims to artistic merit?. Morality in documentaries and fictions. Pedagogical features include illustrative examples, thought-provoking discussion questions and helpful suggested readings.